The QuickBooks 2013 Report window typically provides nine different buttons: Customize Report, Share Template, Memorize, Print, E-mail, Excel, Hide Header, Collapse, and Refresh. You can find out what these command buttons do by experimentation. 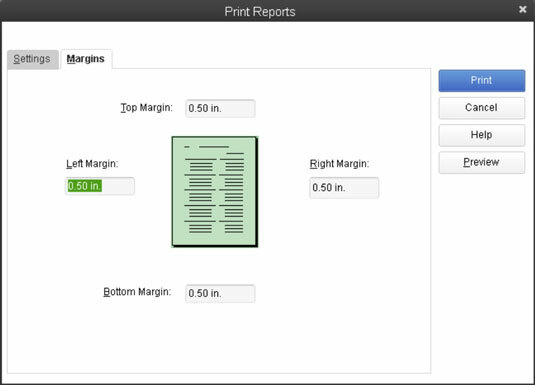 The Margins tab of the Print Reports dialog box lets you specify the margins that QuickBooks should use on the printed report pages. You specify the top, right, bottom, and left margins in inches. 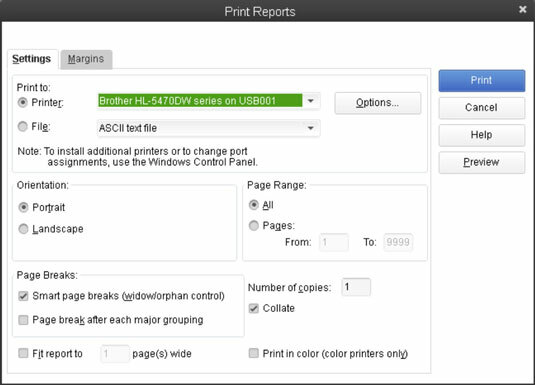 The E–mail command button lets you e-mail a copy of the report as an attachment. When you click E-mail, QuickBooks starts your e-mail program for you. If you click the Excel button, QuickBooks displays a submenu from which you can choose Create New Worksheet or Update Existing Worksheet. 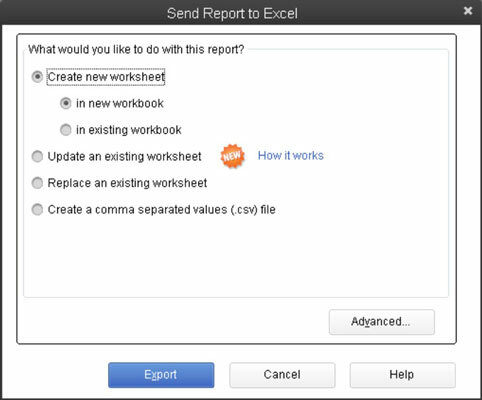 Choose Create New Worksheet to display the Send Report to Excel dialog box. The Send Report to Excel dialog box lets you take the information in a report and copy it to a file that a spreadsheet program, such as Microsoft Excel, can easily open. You can send the copy to a new Excel spreadsheet, to an existing Excel spreadsheet, or to a .csv (comma-separated values) file, which can be opened by just about any spreadsheet or database program. To copy the report to a new workbook, select the Create New Excel Worksheet option and then the In New Workbook option. To copy the report to a new worksheet in an existing workbook, select the Create New Worksheet and In Existing Workbook radio buttons, and then enter the path and name of the workbook in the text box that QuickBooks opens after you click the radio button. If you don’t know the path and name of the workbook, click the Browse button and then use the dialog box that QuickBooks displays to locate the workbook file. If you want to replace an existing Excel spreadsheet with the new report you’re sending to Excel, click the Replace an Existing Excel Worksheet option and then, when QuickBooks opens a text box and adds the Browse button, either enter the path and name of the workbook in the text box or click the Browse button, navigate to the workbook, and select it. Finally, if you want to copy the report information to a .csv file (a file format that can be opened by any spreadsheet or database program) select the Comma Separated (csv) File radio button. If you click the Advanced button in the Send Report to Excel dialog box, QuickBooks displays the Advanced Excel Options dialog box. 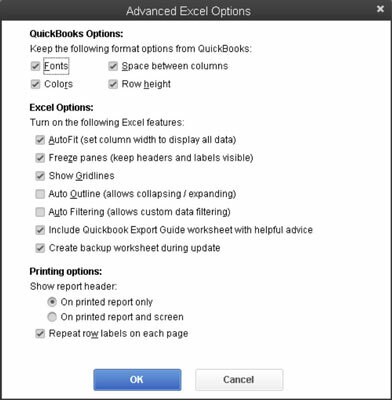 This dialog box allows you to control what formatting QuickBooks copies to Excel (do this with the Formatting Options check boxes), turn certain Excel formatting features on or off (do this with the Excel Features check boxes), and set up some preliminary workbook printing information in Excel (do this with the Printing Options radio buttons). If you’ve entered several transactions in the past week, the report data may no longer be correct. When you click the Refresh button, QuickBooks knows it should update the report for the most recent changes. QuickBooks typically prompts you to update a report for changes to the QuickBooks data file. If you don’t follow QuickBooks’s suggestion to update, however, you can later click Refresh to update.